· ActionScript 3.0: ActionScript is the powerful object-oriented programming language of the Adobe Flash Player runtime environment. Based on ECMAScript, the international standardized programming language for scripting, ActionScript 3.0 further advances the language to offer developers a robust programming model for rich Internet applications (RIAs). Developers can achieve superb performance and ease of development to facilitate highly complex applications, large datasets, and object-oriented, reusable code bases. Executed within the new ActionScript Virtual Machine (AVM2) in Flash Player 9, ActionScript 3.0 delivers breakthrough performance for the next generation of RIAs. · New virtual machine: Flash Player 9 includes a new, highly optimized ActionScript Virtual Machine (AVM) known as AVM2. Built from the ground up to work with the next generation of ActionScript, the new virtual machine is designed to deliver the performance and features to support the needs of rich Internet application developers. AVM2 supports full runtime error reporting, built-in debugging, and binary socket support so developers can extend the player to work with any binary protocol. Flash Player 9 also contains AVM1, which executes legacy ActionScript for maintaining backward compatibility with existing content. · Experience up to ten times faster ActionScript 3.0 execution with the new virtual machine and optimized compiler. · Increase content and application speeds through faster application startup times and a 50% reduction in memory footprint. · Accelerate rendering performance through more efficient, cached vector graphics. · Improve text readability and get faster, smoother scrolling of large text blocks with optimized text rendering routines. · Flash Player enforces security sandboxes for applications, content, data, and URLs to safeguard sensitive data and help ensure safe browsing for end users. · InnovativeDisplay API: Flash Player 9 introduces powerful ActionScript 3.0 methods for manipulating raw graphics and creating custom effects. Create, manipulate, and remove objects from the display list on-the-fly. · File upload/download: Flash Player enables the creation of sophisticated client-server applications using file upload and download APIs. · Flash Player 9 includes the expressiveness enhancements added in Flash Player 8 that enable developers and designers to create breakthrough experiences. · Design immersive experiences for Flash video, content and applications with full-screen mode. · Deliver low-bandwidth, high-quality video with advanced compression technology. · Create high-fidelity text using the advanced text rendering engine. · Add real-time dynamic effects with filters for Blur, DropShadow, Glow, Bevel, Gradient Glow, Gradient Bevel, Displacement Map, Convolution, and Color Matrix. · Create innovative media compositions with 8-bit video alpha channels. · Expand your creative options with blend modes, radial gradient, and stroke enhancements. · Dynamically import additional image formats: GIF, Progressive JPEG, and PNG. · External API: Flash Player supports integration with HTML, DHTML, and Ajax applications through the External API. · Asynchronous communication model: Flash Player is based on an asynchronous client-server communication model, enabling rapid client interactivity without web page refresh. · Universal Consistent experiences: Flash Player delivers consistent content and application experiences across a range of web browsers and platforms. · Express Install: Flash Player enables a smooth, in-context upgrade experience using Express Install and improved Auto-Update functionality. · Input Method Editor (IME) support: Flash Player supports expanded integration with Input Method Editors (IMEs) for Asian-language Flash applications. · Lightweight footprint: Flash Player boasts a lightweight footprint of 1MB, enabling the adoption rate of new versions to consistently reach over 600 million Internet users within 12 months of release. You cannot download any crack or serial number for Adobe Flash Player on this page. Every software that you are able to download on our site is legal. There is no crack, serial number, hack or activation key for Adobe Flash Player present here. Our collection also doesn't contain any keygens, because keygen programs are being used in illegal ways which we do not support. All software that you can find here is freely downloadable and legal. Adobe Flash Player installation package is prepared to be downloaded from our fast download servers. It is checked for possible viruses and is proven to be 100% clean and safe. Various leading antiviruses have been used to test Adobe Flash Player, if it contains any viruses. No infections have been found and downloading Adobe Flash Player is completelly problem free because of that reason. Our experts on malware detection tested Adobe Flash Player with various spyware and malware detection programs, including fyxm.net custom malware and spyware detection, and absolutelly no malware or spyware was found in Adobe Flash Player. All software that you can find on our servers, including Adobe Flash Player, is either freeware, shareware or open-source, some of the software packages are demo, trial or patch versions and if possible (public domain licence), we also host official full versions of software. Because we want to be one of the fastest download sites on the web, we host all the software including Adobe Flash Player on our servers. You cannot find here any torrents or download links that would lead you to dangerous sites. 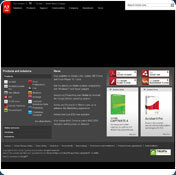 Rate Adobe Flash Player 10.0.22.87!